December 29, 2014—Continuing with my quest to find the perfect framer, I must now talk about Michael’s Arts & Crafts framing. A few months ago I took two finished needlepoint pieces to my local Michael’s in Rehoboth Beach, DE for framing, using a discount coupon. They have this wonderful tool called Michaels Custom Frame Visualizer which I am very excited about since I have a hard time imagining what the finished framing will look like. 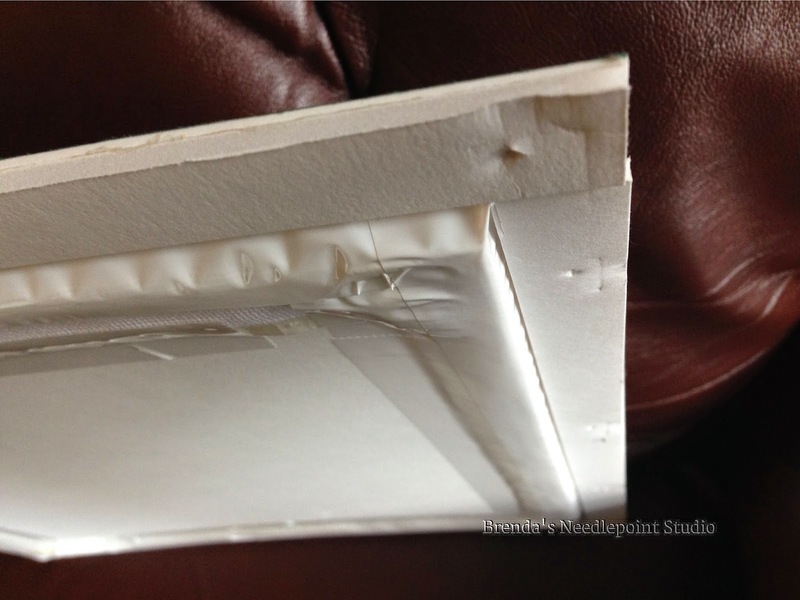 So with coupon in hand, I met with an employee who had been working in Michael’s framing department for a few years and told me he “stitched” canvases to a mounting board instead of using glue. I liked the sound of that. He seemed to understand what it was that I wanted, so I then chose mats and frames using their Visualizer tool. Really had lots of fun with that. Once a decision was made, they were easily able to calculate the cost and, with the discount coupon, the price was about half what I would normally have paid at a regular frame shop. They were even able to print a copy of what my framed piece would look like along with a detail cost calculation. So far, so good. Then I picked up my two items. To my horror, both were crooked inside the matting and some of the unstitched canvas showed. Also, one of my pieces was badly buckled. Spoke with the same gentleman who I met earlier and he assured me there was no problem in redoing the mats and frames at no extra cost. OK, I let him have at it. Then, weeks later, I had to keep calling to find out when they would be ready for pickup. It took almost a month for them to “remount, remat and reframe” my pieces. When they were finally ready though, they were perfect! So yes, they can frame needlepoint, but patience is required and they need to learn. Below are pictures of what they did. Two of my ANG co-chapter members also tried Michael’s framing and both had similar problems, requiring their pieces to be redone. We did learn a few additional things to take into consideration. The first is probably why Michael’s frames are so inexpensive—many are very shallow and anything requiring a thick mounting board and multiple mats will stick out and cause a “bump” in the back under the dust cover. Now, when choosing frames, I will look for those that have more depth on the inside. Another lesson is that they will not cut canvas to fit inside the frame, but instead, will fold it over the mounting board. Not a good idea. 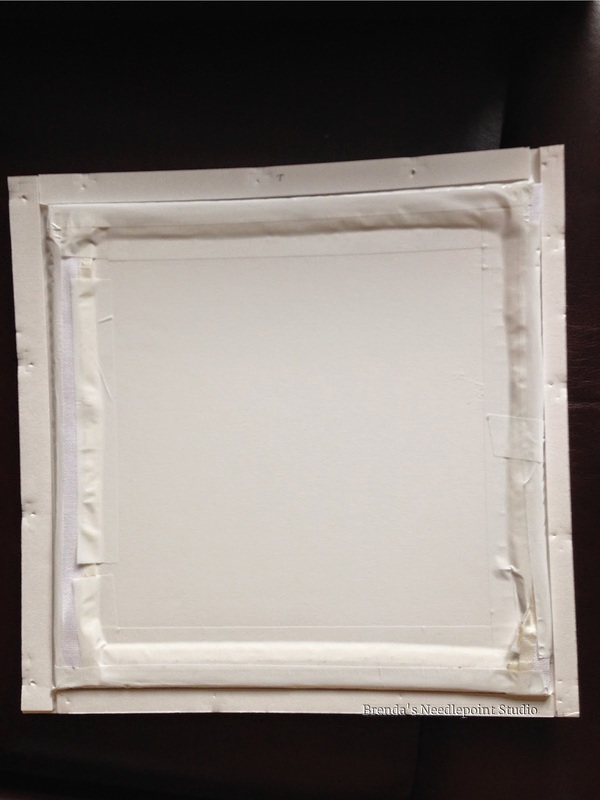 If you want the canvas to lie flat between the matting and mounting board, you will have to cut the canvas yourself to fit the frame—not the end of the world; just something you need to know in advance. I would love to hear from others who have used Michael’s framing and what has been learned in the process. October 22, 2014--Have opened the back of another project--this time done by my new framer in Salisbury, MD who told me they use stainless steel pins. Below is a pictorial of what they've done. I must give them credit, though, for the fine job they did in stretching this piece over the mounting board. It was a large pulled thread project, and even though stitched while on stretcher bars, once I removed the canvas from the bars, it began to "shrivel up". Now it's nice and flat and you can see the stitches perfectly. Note: This project was a pilot stitch program and I'm unable to blog about it until much later this year--stay tuned--it's a beauty. Back of piece. Canvas was first pinned to a board, then tape applied to cover the pins. 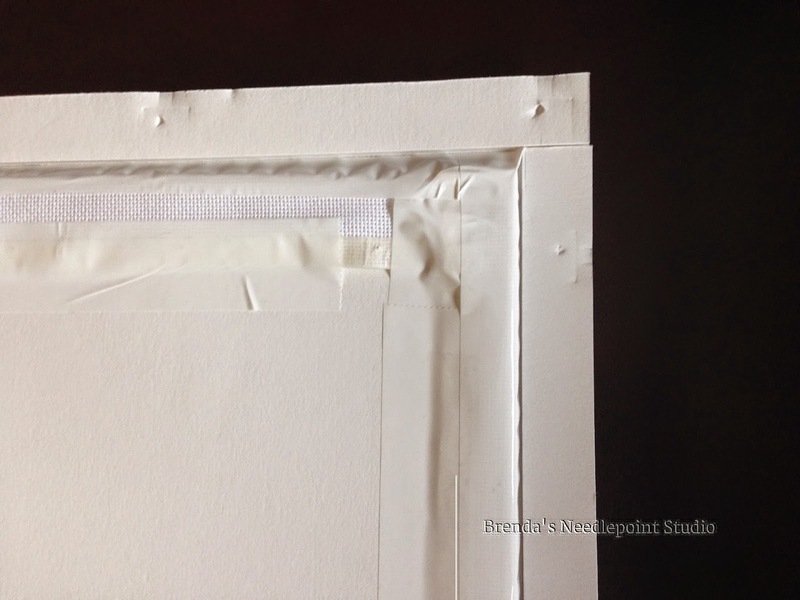 Additional tape is used to secure the canvas to the back of the board. More tape then applied to the edges and attached to the matting. Lots of tape for sure! 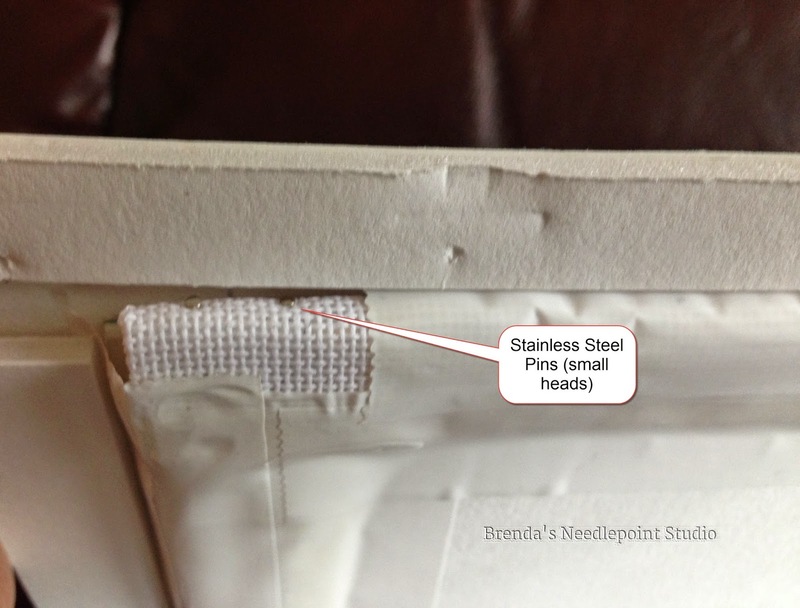 Here you can see the pins used for mounting and how the last layer of tape secures everything to the mat. Since that time, I've wanted to take a peak at some of my framed pieces to see what was actually done, knowing I'll have to pay to have the item reframed and the paper dust backing replaced. So I'm starting with a piece framed at an Alexandria, VA shop in January, 2010, where I was told the needlepoint was mounted on foam board using stainless steel pins. First I removed the paper dust backing, then took out the little "points" used to hold everything inside the frame. Then out came the "whole shebang" which looked to be all glued together as one--the canvas glued to the mounting board and the mat glued to the canvas. OMG!! This was a nasty surprise. Upon further inspection and a little careful pulling apart of the layers, I could see the canvas was stapled onto the mounting board, so no glue was on the back, but glue was used on the front canvas edge to attach the mat. Even though I no longer live in Virginia, I'm going to give that frame shop a call to get an explanation about this. Next month I'll take apart another piece that was framed at a local shop I recently found out about who also told me they use stainless steel pins for mounting. Crossing my fingers. I always keep my framing paperwork attached to the back of my pieces. This way I know who did what when. Reading your blog validates my OCD on this matter. When I purchase art I also keep all records attached to the back of the piece. *jaw dropped* Now I'm getting paranoid. I've had linen pieces framed with a mat. I really hope they didn't use glue.